I visited the picturesque little churchyard at Glen App, just north of Cairnryan, today. 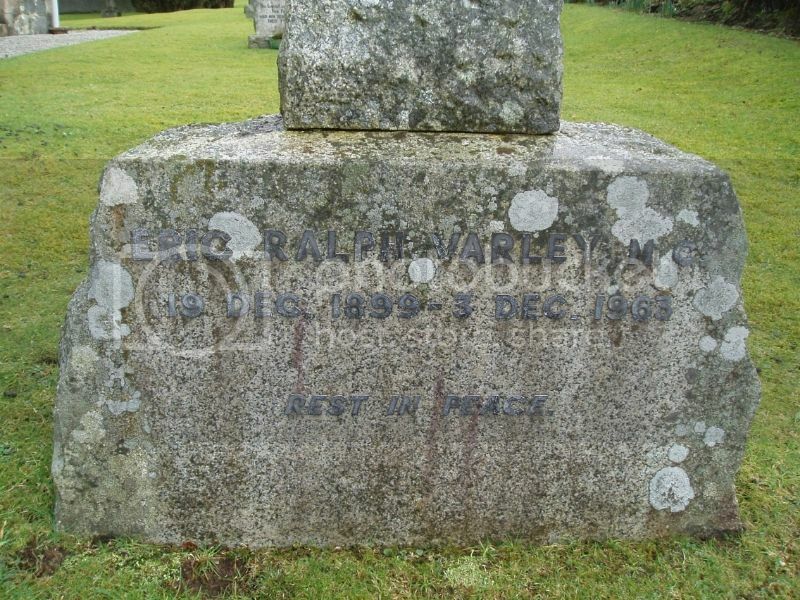 It is dominated by the graves of the Inchcapes (P&O Shipping magnates ) whose family seat was at Glenapp Castle nearby but there was one grave that may be relevant to the project: Eric Ralph Varley MC. A quick Google reveals the following: "Eric joined the Royal Flying Corps in 1917 and trained as a fighter pilot; he was awarded the Military Cross in March 1918 after being badly wounded. He was one of the last 'flying' officers to receive this award before the introduction of the DFC in April 1918. During the 1939-45 War Eric was a flying instructor with the RAF at No.15 Elementary Flying Training School, Kingstown Aerodrome, Carlisle. Rowland served in the South Staffordshire and RAF Regiments on airfield defence, and later in RAF Training Command" (http://homepage.ntlworld.com/r_m_g.varley/Family_page.html). Before I commit myself to a new thread could anyone verify that this is one and the same Eric Varley, please. T./2nd Lt. Eric Ralph Varley, Gen. List and R.F.C. For conspicuous gallantry and devotion to duty. Observing two enemy two-seater machines, he, by skilful piloting, obtained a position under the tail of one and opened fire at close range, with the result that the hostile plane fell out of control and crashed. On two later occasions he attacked and destroyed two other hostile machines, the pilot of one being taken prisoner. He has also shown great dash in attacking enemy balloons and hostile troops on the march, and has displayed marked gallantry throughout. Appointed Pilot Officer for the duration Eric Ralph VARLEY (84504). the KINE RESTAURANT AND SNACK BAR, 9 St.
with effect from 30th September 1966.
of the late Eric Ralph Varley. Thanks Ken, that's really helpful. I'll start a thread for Glenapp.